Billy Graham’s mother, Morrow Graham, made this dessert for her family and friends. Try a piece for yourself if you get the chance to visit the Graham Brothers Dairy Bar at the Billy Graham Library in North Carolina, or make an entire cake for your favorite people. 1/4 teaspoon mace (or flavoring of your choice) Note: Mace is similar to nutmeg. Cream butter (at room temperature) and sugar until light and fluffy. Add eggs, one at a time, beating well after each. Beat mixture thoroughly. Sift together flour, salt and baking powder. Gradually add to batter, mixing well. Add mace and blend thoroughly. Then, slowly add heavy cream and stir in well, but don’t beat. Pour batter into a large (10-inch) well-greased and floured tube pan and bake in slow oven (325 degrees) for 1 hour or 1 hour and 15 minutes—or until cake tests done. Mix flour and sugar together in saucepan. Add lemon water and cook until thick. Spread topping over cake and sprinkle coconut on top while warm. >> Morrow Coffey Graham taught her children valuable life lessons. See how you can apply these 7 lessons Billy Graham said he learned from his mother. 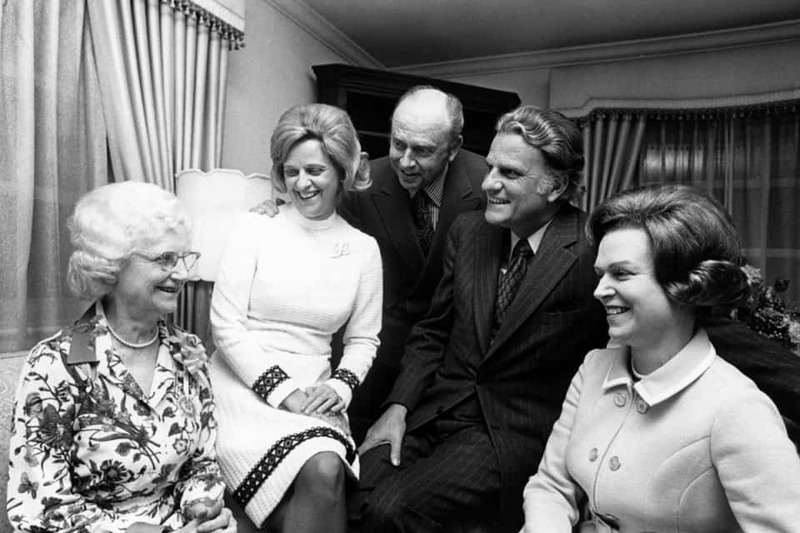 Morrow Coffey Graham, Billy Graham’s mother, with her children on Feb. 28, 1971. From left to right: Jean, Melvin, Billy and Catherine.